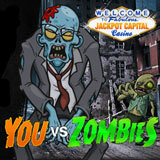 Take a zombie walk at Jackpot Capital Casino this Halloween and pick up some of the $80,000 they're giving away during the You vs Zombies casino bonus promotion. More than $13,000 will be awarded every week -- lots of it to reward frequent players, but lots of it is given away through random draws, so everyone can win! Jackpot Capital players earn scoreboard points by playing casino games in either the online casino or the new mobile casino. You pass through six stations on the zombie walk as you earn more and more points. The higher the station, the bigger your bonus Make it to the top and get $500! Jackpot Capital Casino has a wide selection of slots and table games from Realtime Gaming (RTG) including the new Bubble Bubble Halloween slot that was just added to the main online casino as well as the new mobile casino for smartphones and tablets.